Today was another day that didn’t appear long on paper but really had worn us out by the end. We woke up at 6:30, which has become our standard morning procedure, and after filling our water at the convenient spigots right next to our tent sites, got on the road. The day started with about 1.5 km of road walking, just enough for us to get a taste of that well-known foot soreness particular to pavement, before dumping us directly into the Taiharuru river. 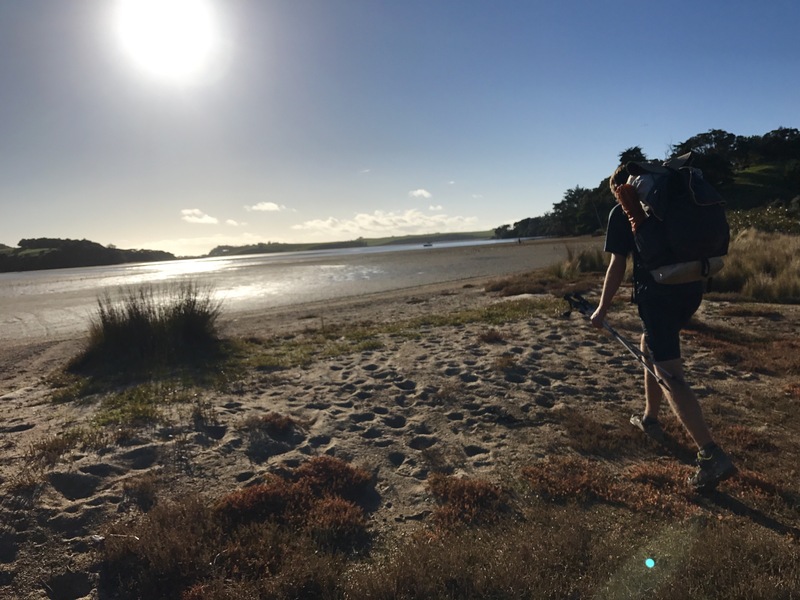 It’s an estuary, meaning it varies with the tide, so we had to plan to cross at low tide so the walking approach and then the actual crossing would be easier and safer. It worked out fine as low tide was about 7:30 and we started hiking that section by about 8:30. An even lower tide would have been super great. 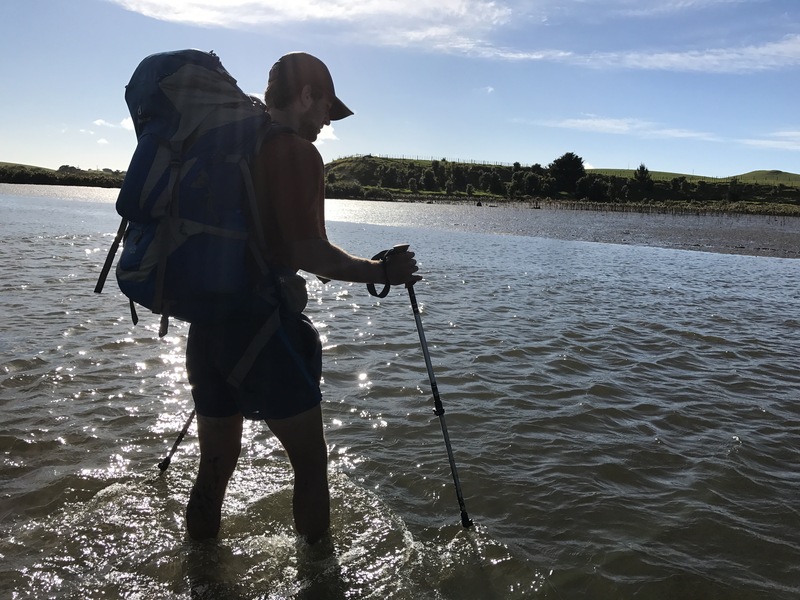 We trudged through the terrible swamp mud for a bit but found that weirdly it was harder-packed out towards the water, away from the bank, and ate up a quick but wet km or two before arriving at the crossing. It was short but about mid-thigh-deep, which also unfortunately means pocket-deep, so my phone, which I didn’t remember was in my pocket, got submerged and hasn’t revived yet (even though we luckily had a bag of rice to keep it inside of all day). 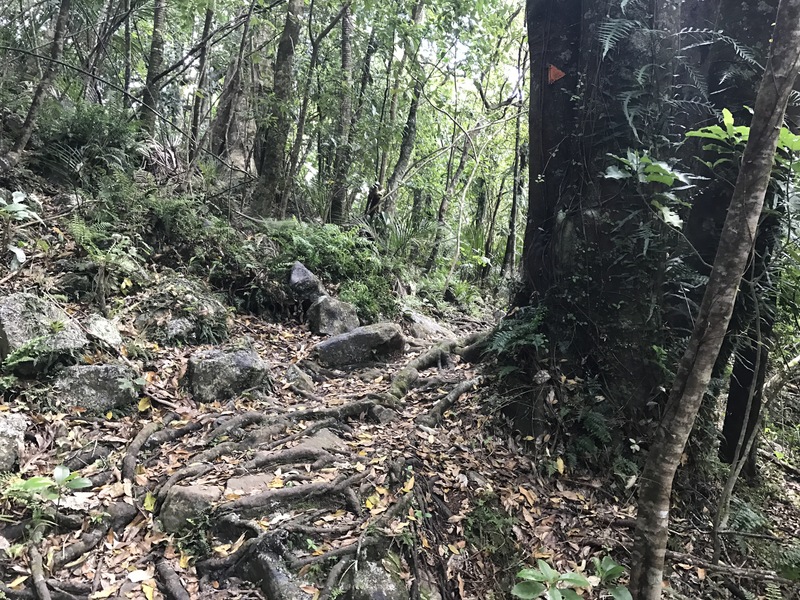 After the estuary section we climbed through some fields to a gravel road (here they call them ‘metal’ roads – some quick trivia) and to the start of the Kauri Mountain track. This track took us pretty steeply (in the moment quite steeply but compared with our afternoon adventure it pales) up a mountain with our first amazing views of the day, north along the coast. After some more road walking we got to the start of the beach section of the day, which by that time we were doing at high tide and so was some of the most annoying and tedious hiking of the day. By that point, we had all been drinking our water and realizing that what we had filled up with back at camp was just so bad- probably brackish and it made us actually gag as we drank it. And of course we had all filled up completely because it was so easily available. If you stay at Treasure Island in Pataua make sure you fill up in the picnic area above the kitchen. 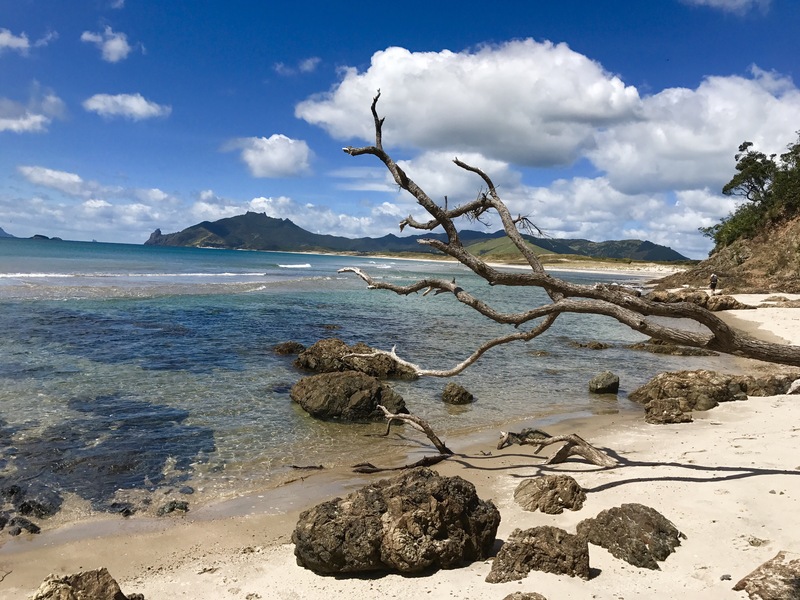 But we slogged through the beach, with a lunch break about a km and half from the end, and decided that we wanted to push further and try to stay somewhere around Urquharts Bay or Taurikura. The major obstacle was these enormous cliffs towering over the town of Ocean Beach, which we would have to hike over and around- to give you an idea the track (Bream Head Track) was only 6 or 7 km long but was supposed to take 5-6 hours to complete. It climbs from sea level to 476 meters and follows a ridge to two other peaks. The climb up was insane and without a doubt the steepest and longest climb we’ve had to do so far, but after about an hour and multiple panting breaks, with no relief because of our water that felt like it was actively dehydrating us, we were treated to maybe the most amazing view we’ve seen yet. 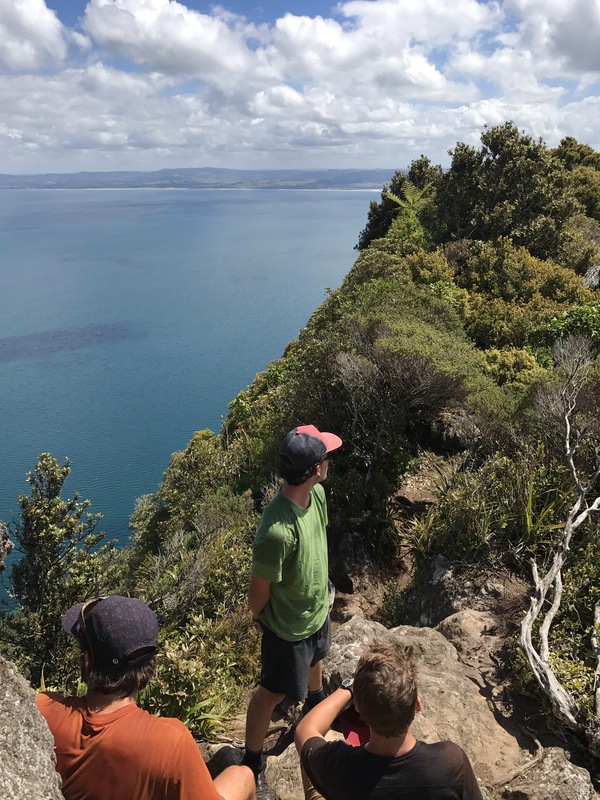 Perched on a rocky outcrop under a huge monolith that formed the actual peak, we sat for about ten minutes overlooking the tropically blue water and the miniature boats and people and imagining what it would be like to wingsuit dive off the viewpoint. It was 3 o’clock though, not comfortably early with nowhere planned to stay and much more of the lovely steep stuff left (up and down) so we sweated and wheezed our way along the ridge, arrived at the last peak at 4:40 and had finished the track down at sea level, just shy of 1200 steps down, by 5:30ish. Along the way Shepard’s groin was not feeling too hot and Jack’s pinky toe blisters really reared their heads. 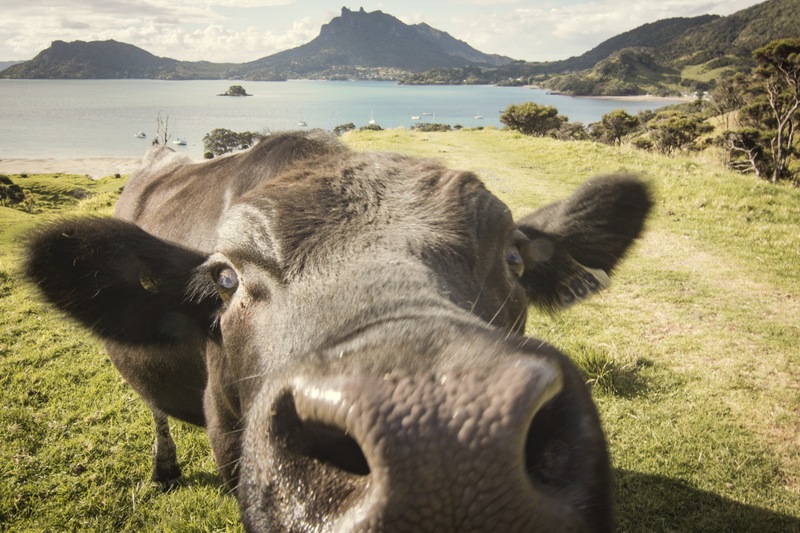 Some sick views and some cute cows at the end and a kiwi who appeared to have just ran up all 1200 stairs, stopped at a lookout for about six seconds, as we put our packs on, and immediately turned around and ran back down. All in all I think that we’d all be in agreement that it’s one of the most beautiful little tracks so far. 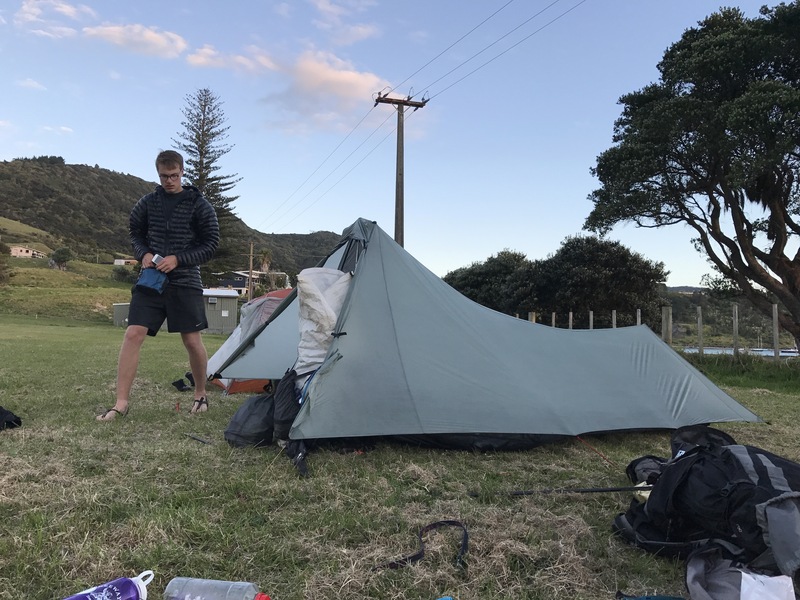 Once down in Urquharts Bay, we started looking for a place to camp, did about 4 km of the most beautiful road walking so far, and pulled into a motorhome parking field where we are set up now. Convenient location next to the general store meant we immediately got some ice cream and chips, and we have just watched the sun set over the harbor and the Whangarei Heads as Saturday night fireworks explode around us. A really varied day of hiking, combining road, mud, beach, and jungly mountain sections, and a super long and tiring but rewarding one. 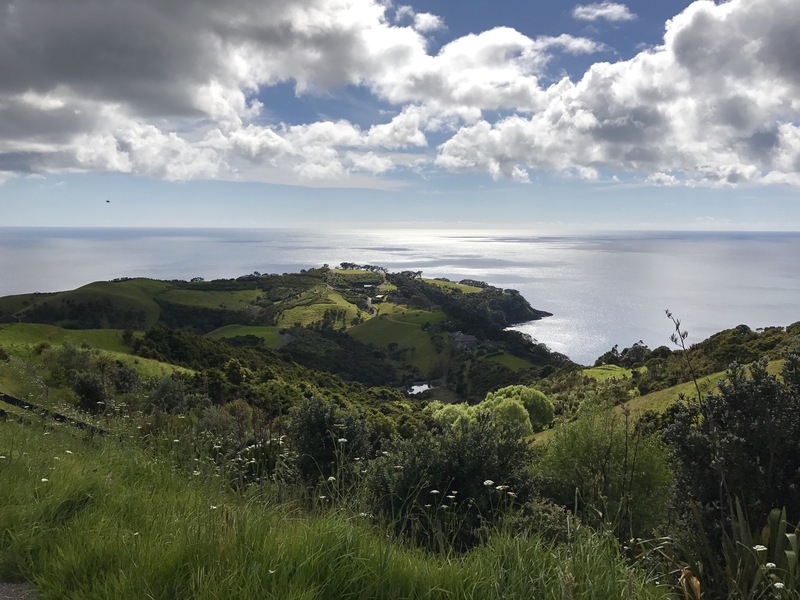 It’s funny how by now the views at the top of Kauri Mountain which were sick by themselves have been faded and overshadowed, not even really by amazingness but by them being so long ago this morning, by the stuff we saw on the Bream Head Track. Anyway be prepared for some of the muddiest shoes of the trail, without a chance to wash them off before diving into the dry sand. A huge high point was eating gummies at the top of a peak, and the sleep I am about to fall a. Ha word games woo. Good night and say a prayer for the health of my phone!